Updated Tuesday May 1, 2018 by Shelton Flag Football. All registrations are done online. Please log in at the top of the website and create an account. If you are a returning player please log in and register for the upcoming season. Please be sure to include cell numbers etc. Important league communication is handled through your league account. Annual Fundraising Fee: $50 per player. There is a $100 maximum fundraising fee per family. Additional late fees may apply. Registration fees ARE NOT refundable. ** LATE FEES WILL BE ASSESSED STARTING MAY 1 FOR EACH REGISTRATION REGARDLESS OF FAMILY DISCOUNT. All players must register online. Please create an account through this site. Payment is made via credit card. SFFL has three divisions broken out by age. The age cutoff date is August 1 of this year. Below are the divisions and age groups for each. Micro - Ages 6 and 7. 5yo players may play Micro only if they turn 6 by December 31 of the current football season. Varsity / JV - Varsity consists of ages 11, 12 and 13. 13yo players may NOT turn 14 at any time during the football season. The maximum grade level of any player is 8th grade. JV consists of players ages 8, 9 and 10. Game jersey, practice jersey, shoulder pads, and flags. Player must provide white football pants (game and practice suggested), cleats (molded plastic, no metal), socks, mouthpiece (2), and a white helmet. All players will be placed on a team. New players to SFFL or players moving up from the Micro division to the JV division will participate in a player draft day. Date of the draft will be posted on the website. All players will be drafted to a team. All returning players will remain with their current team. Players moving from JV to Varsity will remain with their current team. 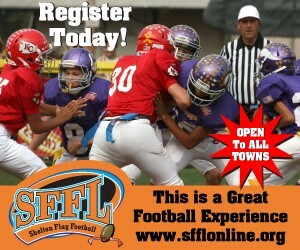 Shelton Flag Football is a modified flag football league. Football skills and fundamentals are taught. Players ranging from 5 - 13 are eligible to play. Five-year-old players MUST turn 6 by 12/31 of the current football season.